Blooming right now: yellow buttercups, pale pink geranium, purple columbine, red bleeding heart, purple lilac (but fading), white lilac. More color flutters about: several species of moths in various leafy browns, tiger swallowtails, more. One of these days I'll try to learn butterflies too. 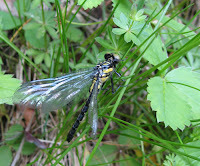 Not to mention this glorious dragonfly in gold and black, and the handsome Indigo Bunting.